Where has the last week gone??!! 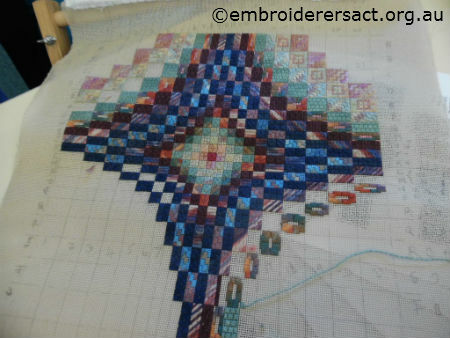 I can’t believe it’s over a week since the previous post. 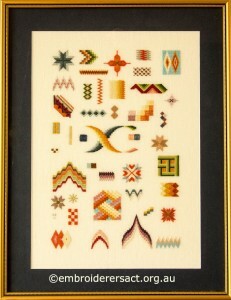 Stewart Bath was clearly intrigued by this lovely piece because he’s photographed close-ups of every motif. 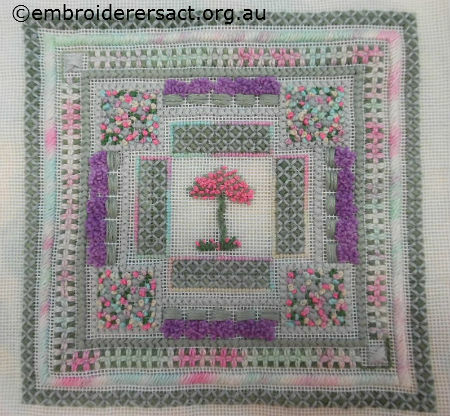 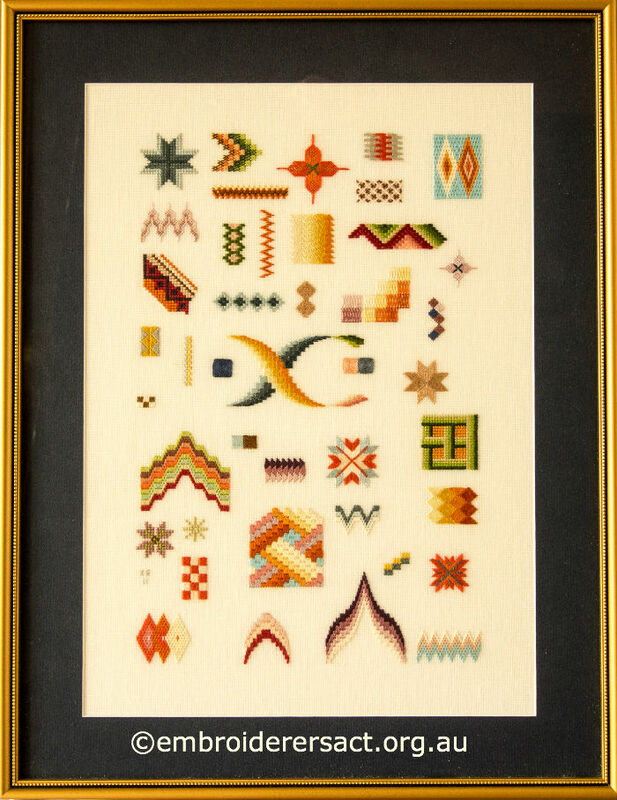 I’m going to show a selection only in this post as there are 31 motifs and to include them all would make this an ultra marathon post! 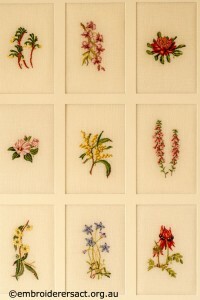 The whole collection is on the Canvaswork Gallery here. 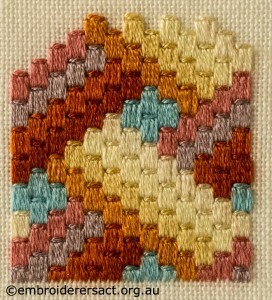 Awesome use of colour, pattern and geometry don’t you think? 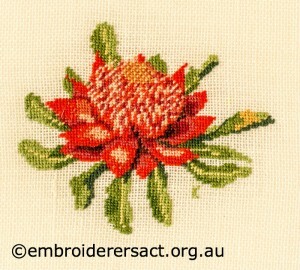 We’re enjoying the Australia Day long weekend here in Canberra. 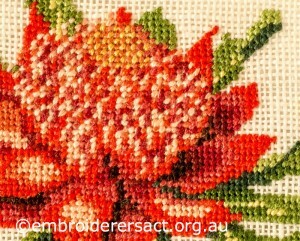 To celebrate we’re going to share some lovely work featuring Aussie themes. 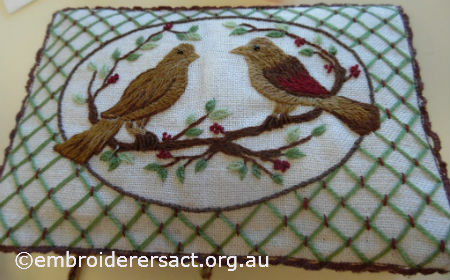 In this post we’re showing you a lovely piece of Canvaswork stitched by Kay Reid. 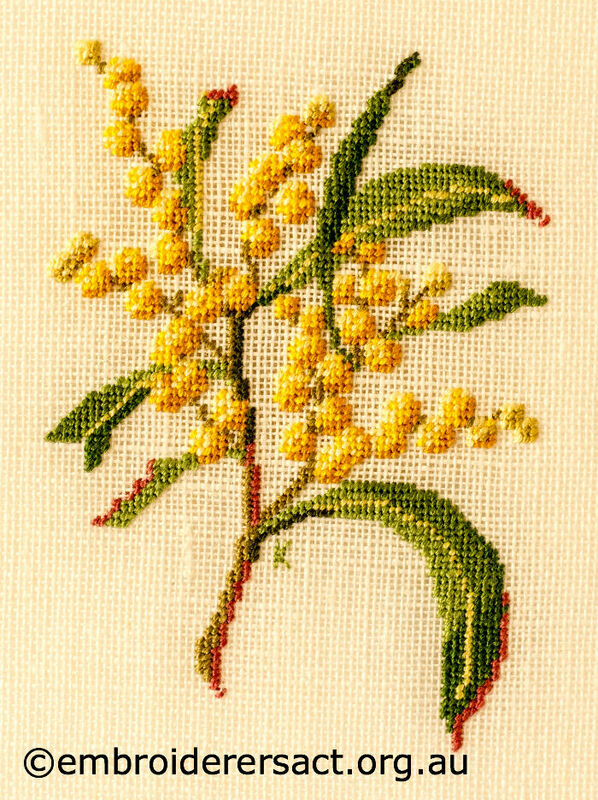 The design showcases Australian floral emblems. 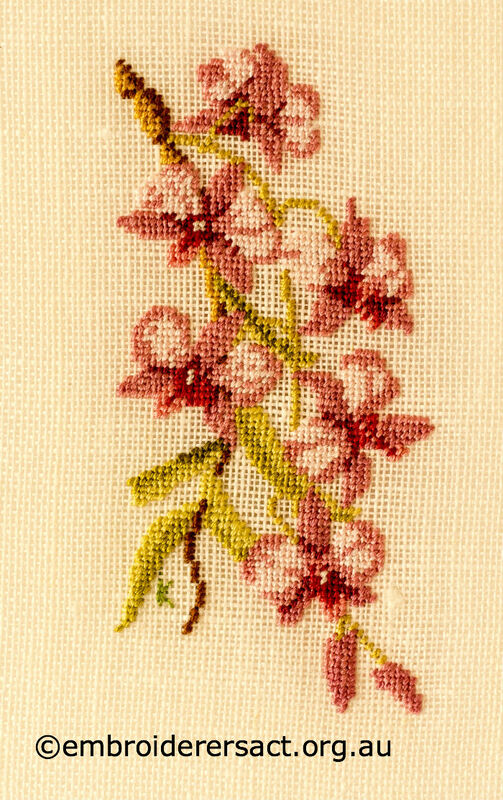 and now for some close-ups….. 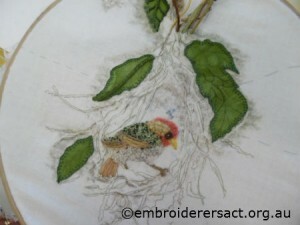 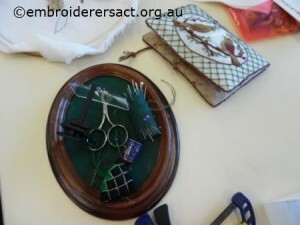 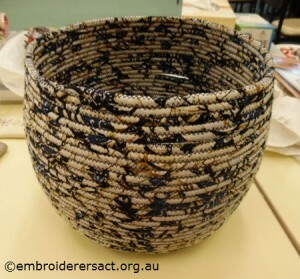 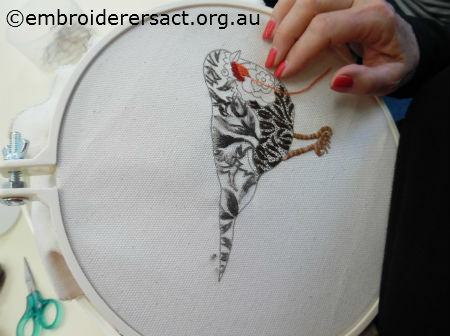 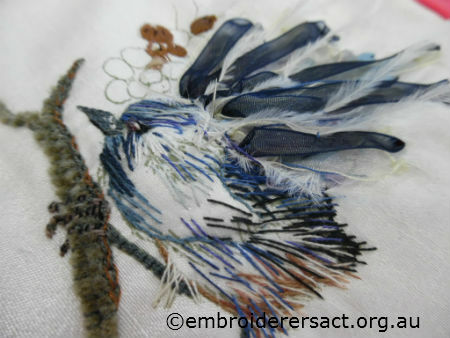 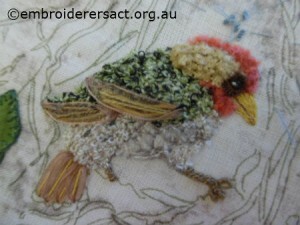 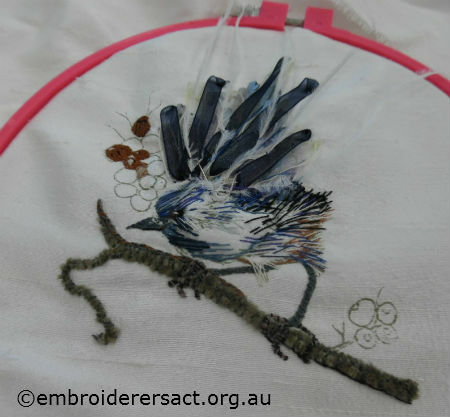 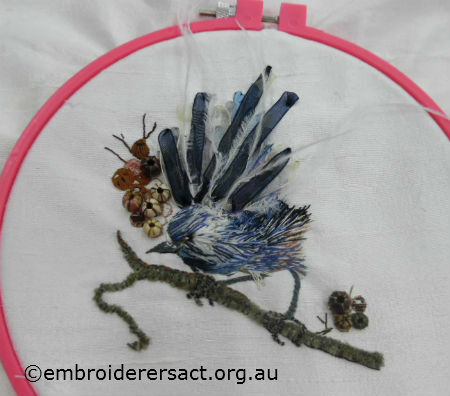 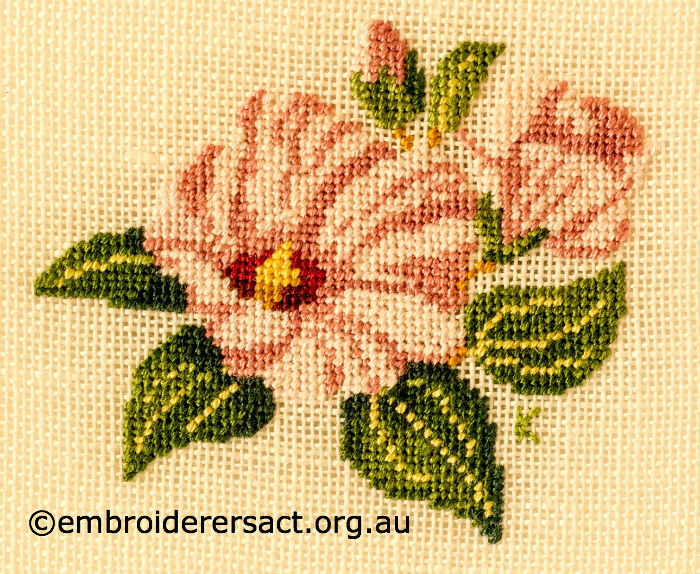 Thank you for sharing this awesome embroidery Kay and also Stewart (Bath) for the great photos. As a treat for the start of the New Year here’s an update of the following galleries for you. 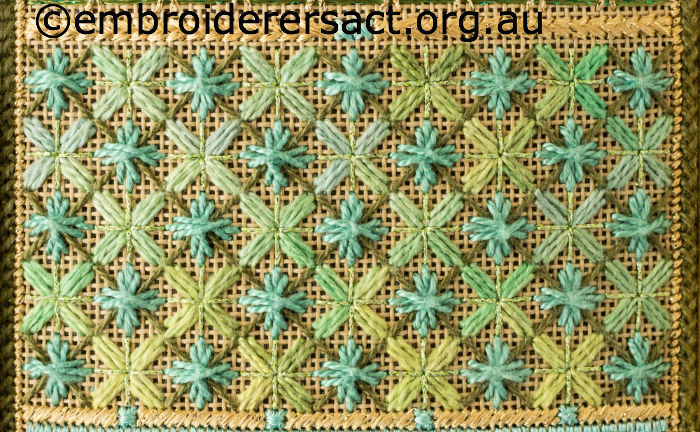 I’m really enjoying the tropical colours of North Queensland especially the warm greens which all tend to be at the yellow end of the spectrum. 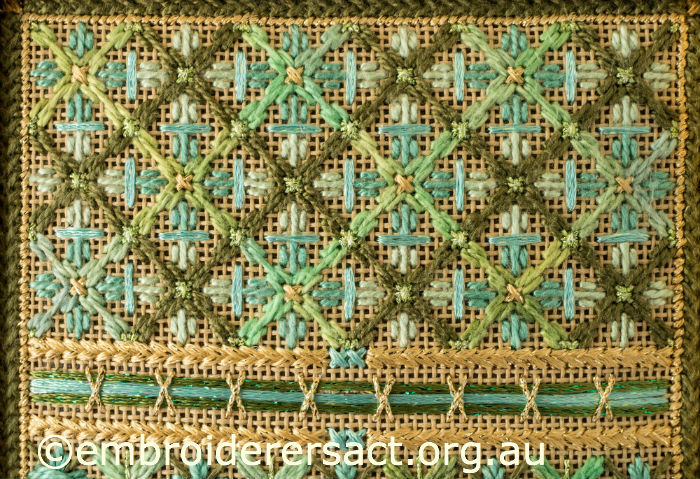 There are none of the cool greens of cooler climates. 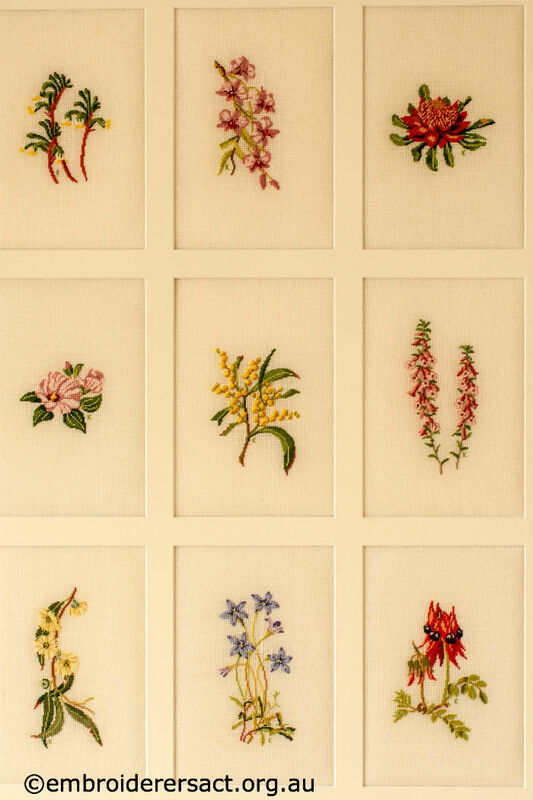 So today when I received the latest CD of photos from Stewart Bath I was immediately taken with a very elegant Colour Study in Canvaswork stitched by another of our very talented members Kay Reid. 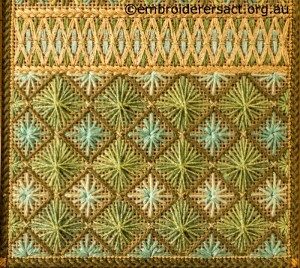 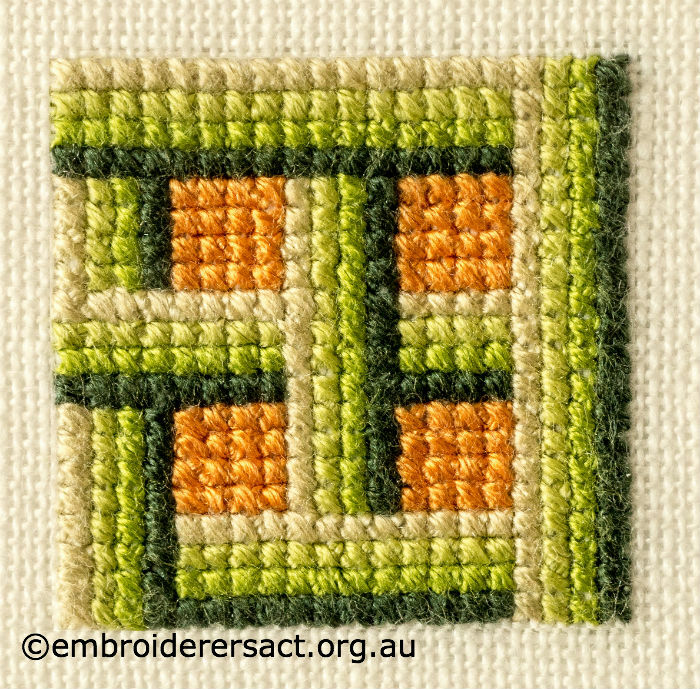 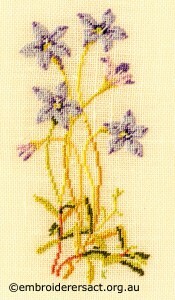 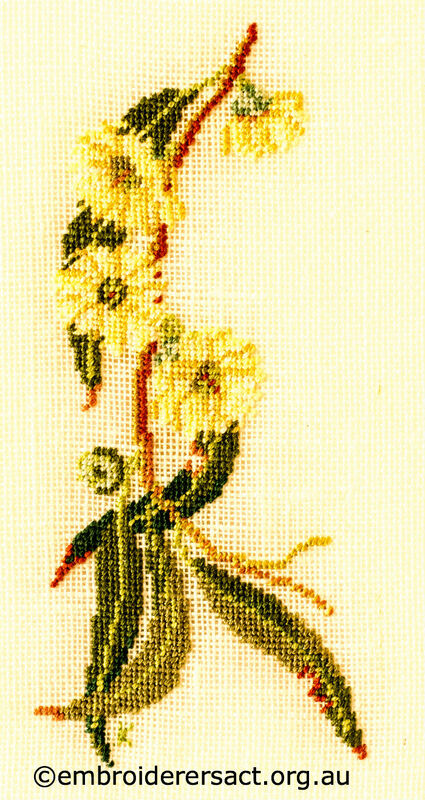 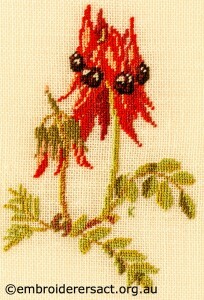 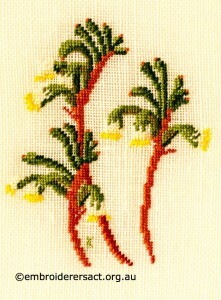 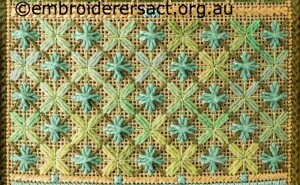 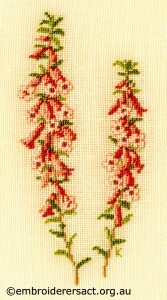 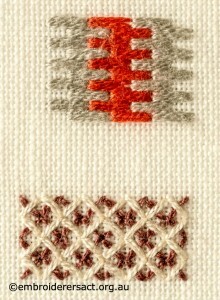 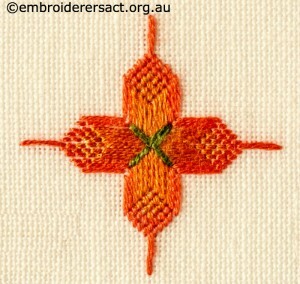 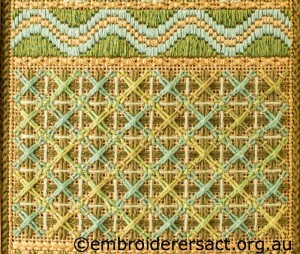 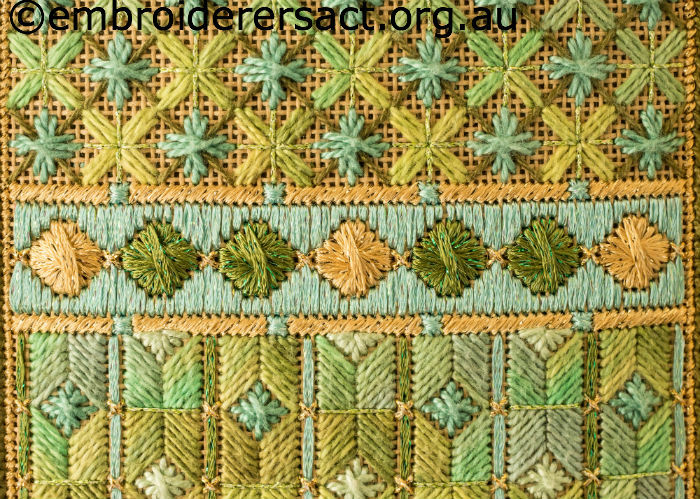 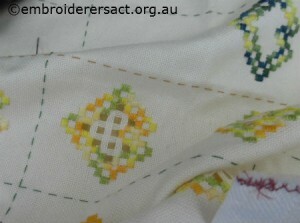 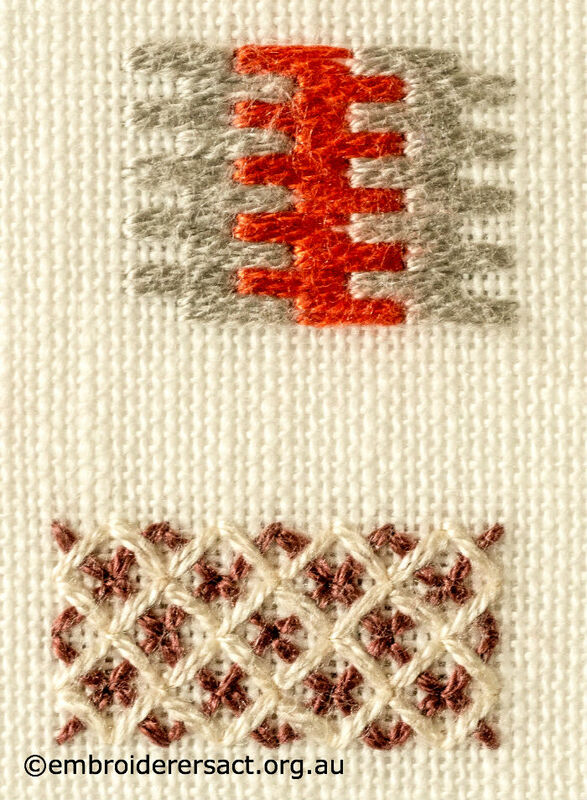 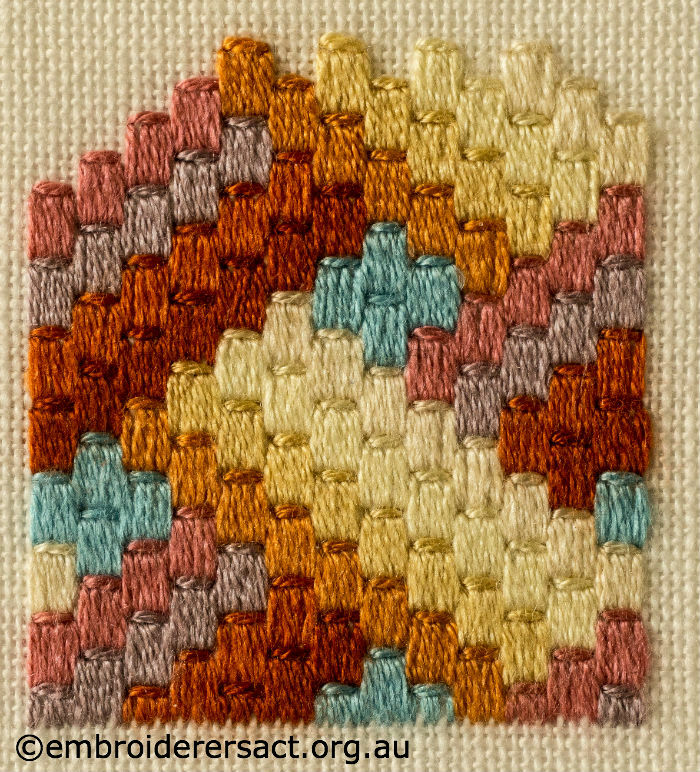 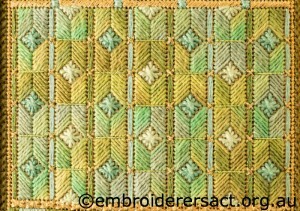 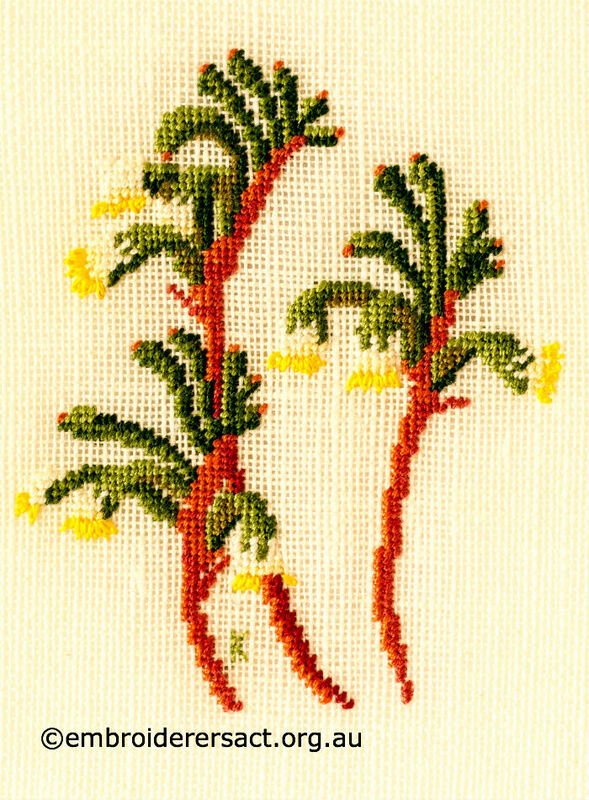 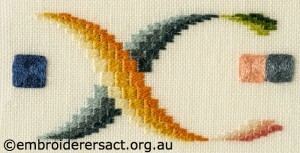 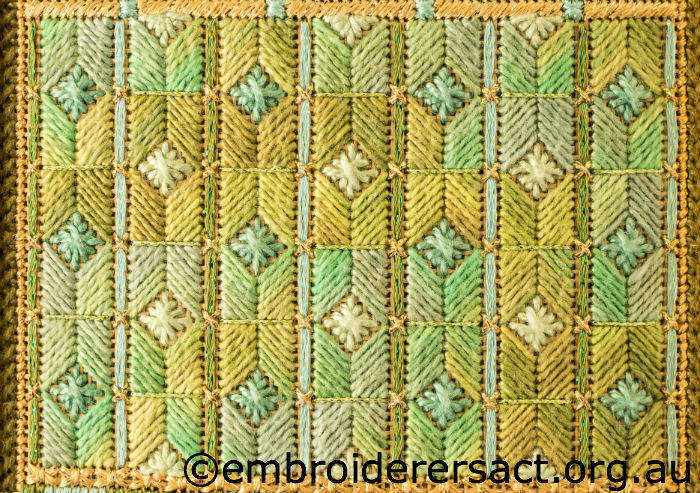 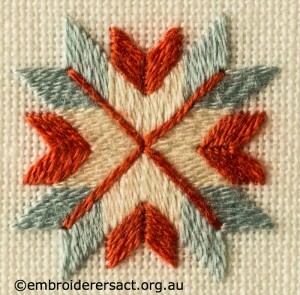 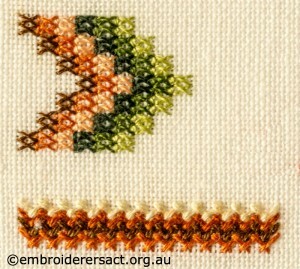 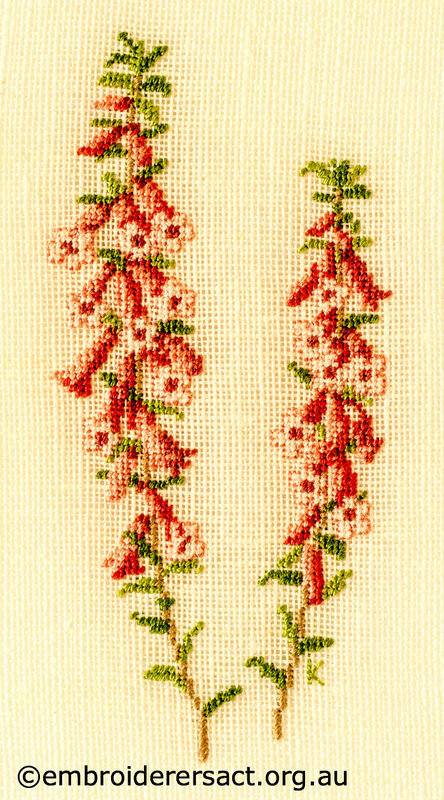 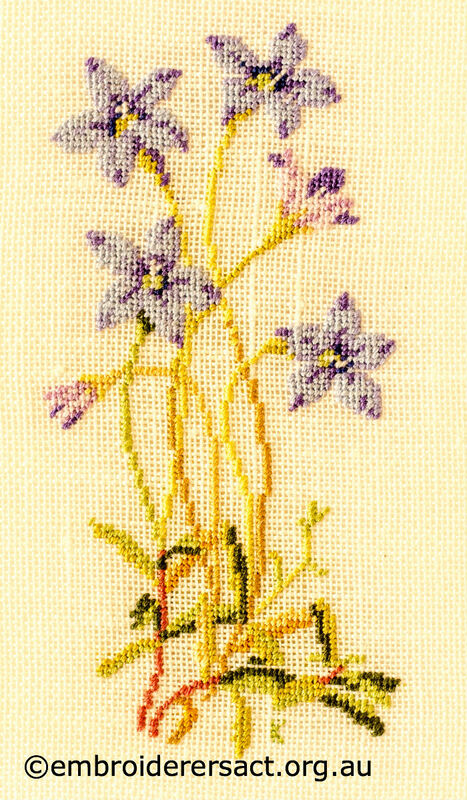 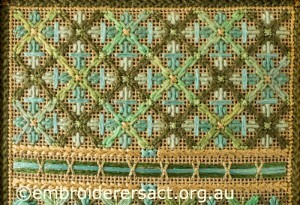 As the name suggests this is a technique stitched on canvas or similar foundation material rather than on fabric. 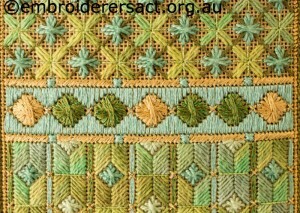 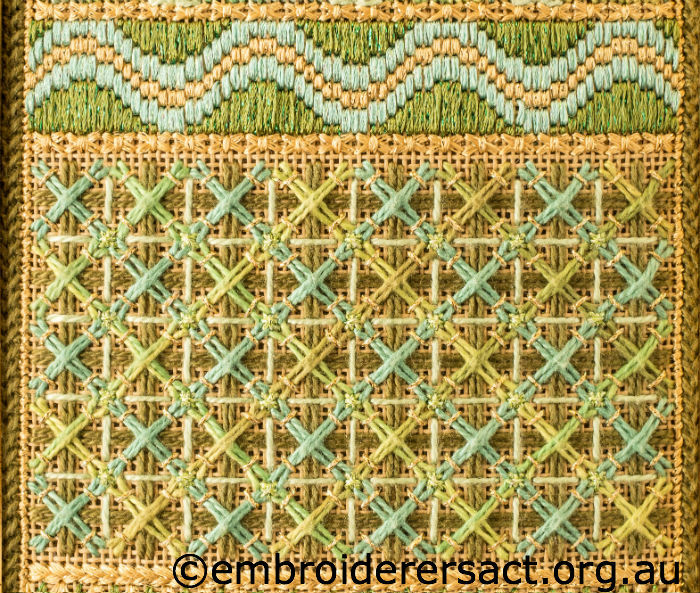 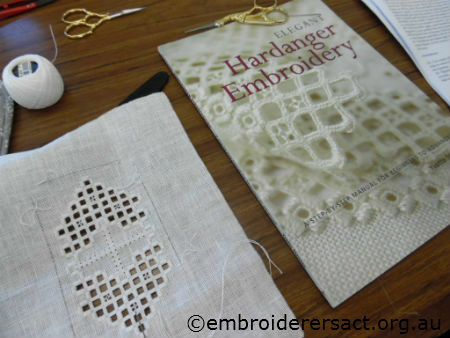 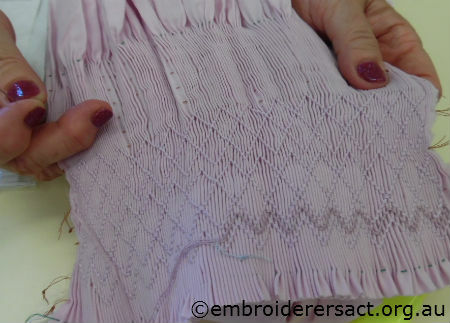 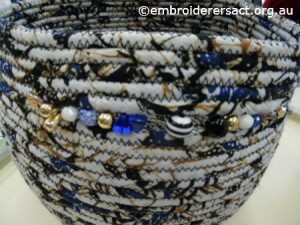 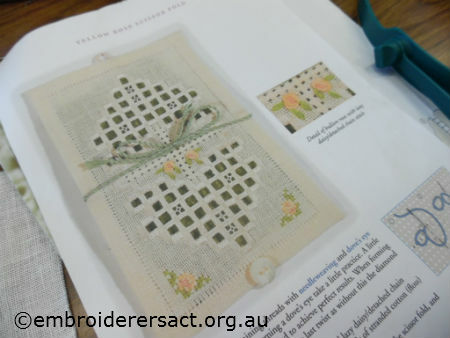 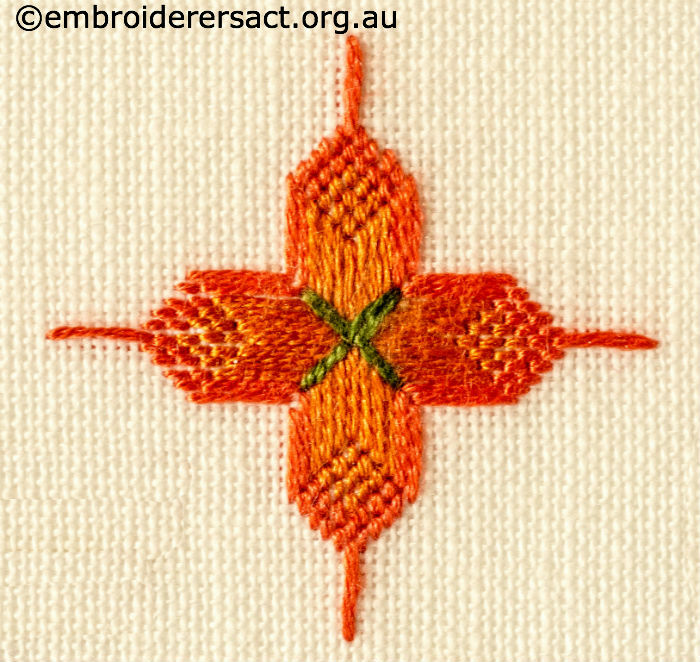 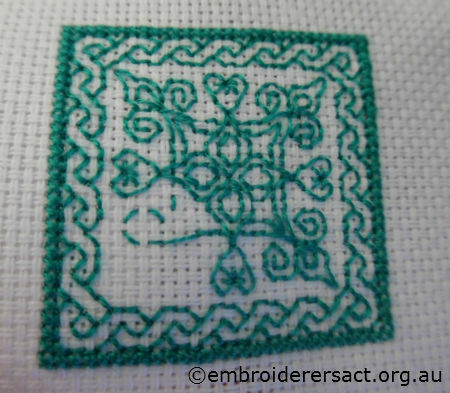 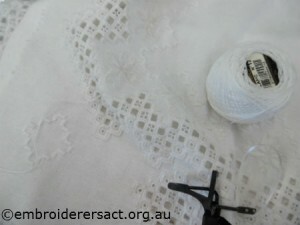 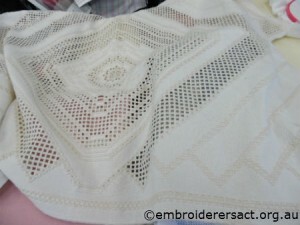 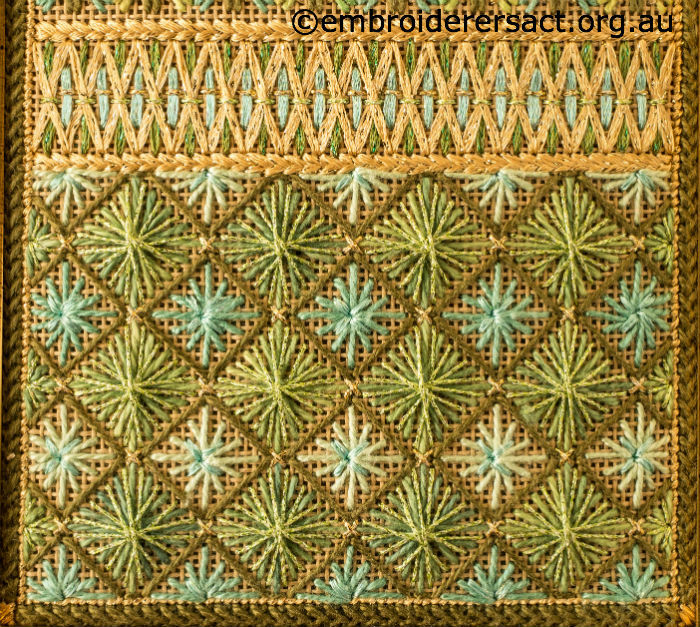 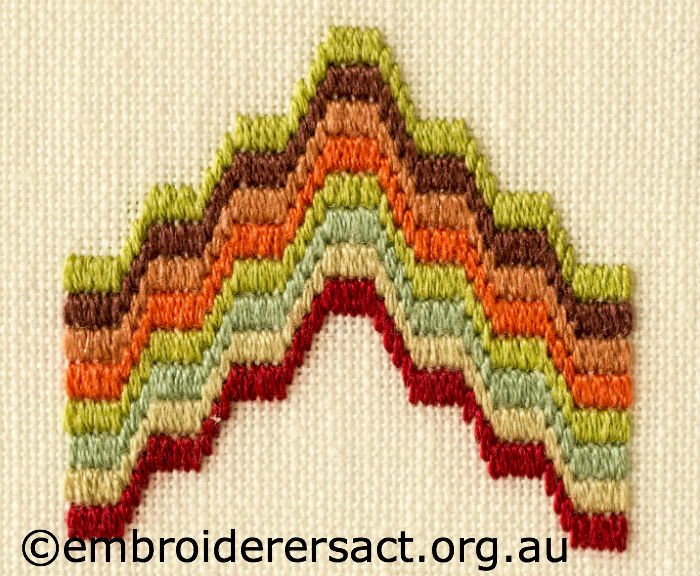 It’s counted thread work and its hallmarks are geometric patterns and precision stitching. 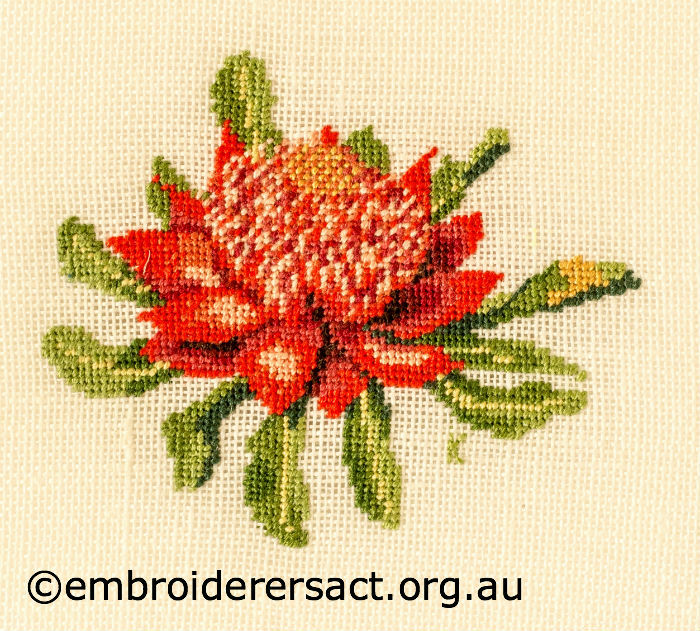 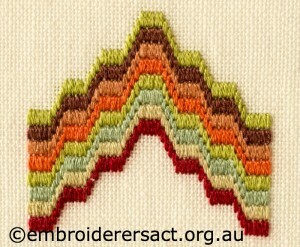 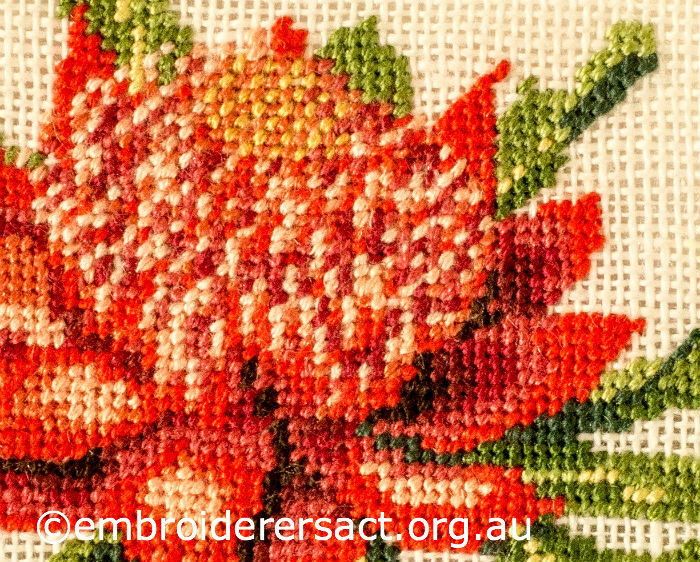 The most familiar forms of Canvaswork are Tapestry/Needlepoint, Petit Point, Bargello etc. 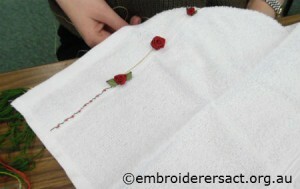 You can use various kinds of thread and tapestry needles which have blunt ends. The bluntness of the needles stops the thread catching and splitting as you stitch in and out of the canvas. 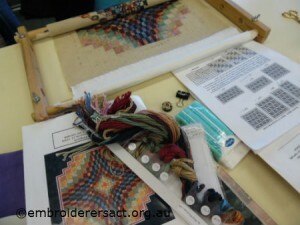 Thank you Kay and Stewart for sharing your awesome work with us.